It seems that when it comes to books, I’m even worse. These days, the only way I will hear about a good (new) book is if there is a movie being made out of it (and some of those aren’t really that good either). I have a pool of authors I follow and read, whatever they publish, but adding to that pool is rather difficult. Even when I find a book blogger I share tastes with, some of those reviews just don’t sound that appealing to me. I also sometimes wonder how many people are actually intrigued enough by my reviews to read a book I found great…? In the haystack that is the book world, finding your needle is very difficult. And the blurbs don’t help. The only reason I wanted to read World War Z was because I really liked the movie and thought the book must be better. Then I read the blurbs for the book and wasn’t very sure about my choice. Luckily, this time around, I decided to ignore them. The thing is, that book is one of the best new books I’ve read in quite a while and I wouldn’t even know it existed unless for the movie. That’s why I’m a bit sad now. How many more books like that are passing me by because I don’t know where to look? Or who to trust? 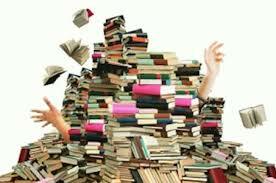 Do you have a way of figuring out what books ought to be on your TBR pile? And how do you select from the pool of new authors those, whose books might be worth reading? Or is it basically luck? Hey Ines! My husband works at a book warehouse! So he brings home a ton of books (you know, those ones that the front cover is ripped off? I’m don’t remember the reason for publishers to do it…I’ll have to ask him again today when he comes home from work). Then I’m on goodreads and see what my friends there are reading, and I also follow a bunch of book blogs. I also get recommendations of books from real life friends and family – my one sister is a librarian and my Mom is a voracious reader too and is in a book club. When I go to the library, I always peruse the “new releases” shelf. So I guess I’m kind of in the same situation you are! There are books, good books, that fall through the cracks in my life here. But one thing I have been doing more and more is when a book really stinks, I have no qualms not finishing it (which is something I had a hard time doing in the past). And that gives me more time for better reading. So for choosing among ALL these recommendations? Oh gosh, I guess whatever fits my mood at the time. And if, say, I just read a bunch of mysteries, I then may want to cleanse my palate and have something lighter next on my to-read list. I fear I have been no help at all! You just made me jealous since you seem to be surrounded by people who read regularly and to who you can talk about books. Plus, since I mostly read in English, I can’t even peruse the New releases shelf in my library (I gave my card to my mom, she reads in Croatian). Oh and your question about if you have reviewed a book, do people seek it out? Well I am tapped to read Scott Lynch and Justin Cronin after I have finished Sherlock Holmes. You are one of a couple on-line pals who have mentioned Lynch, and the first to mention Cronin, and both authors intrigue me. Lynch is actually very good. Just thinking about his books brings a smile to my face. I can’t wait to see what you will think of them. I was at the library this afternoon and got the Cronin (The Passage)! The first Lynch was out 😦 . I should have put a hold on it, but I figured it I love The Passage I will want to read The Twelve right after. Thanks for the recommendation! Can’t wait to hear what you think of The Passage…. I’m really enjoying it so far, but only a couple of chapters in! I get my book tips from two sources basically: reviews in the weekend papers and friends’ recommendations. I have a pile of unread books that would reach floor to ceiling if I stacked them up, so don’t feel bad for feeling behind – I only seem to manage a few each year, but I do religiously stock up on them! This backlog (booklog!) is partly down to the temperature of my bath water as I think I mentioned before. Oh Vanessa, my pile of books to be read is luckily no longer that visible as I get most of them through NetGalley for my Kindle so they linger there. I’m trying to be smarter about books I request nowadays because in the beginning I was optimistic and requested many.